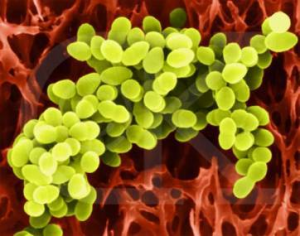 Lactococcus lactis plays an important in dairy industry. It is a microbe classified informally as a lactic acid bacterium because it ferments milk sugar (lactose) to lactic acid. The lactic acid curdles the milk that then separates to form curds, which are used to produce cheese and whey. The lactic acid produced by the bacterium lowers the pH of the product and preserves it from the growth by unwanted bacteria and molds while other metabolic products and enzymes.